20 January 2012 will be etched into my mind forever. It is the day, if any of you who read this blog with any regularity, I lost my job. So it has been a little over 6 months and I have gone through several periods of ups and downs. Anger, sadness, grief, disbelief, depression and forgiveness come to mind. I even read a book on how to be positive and upbeat all the time in order to bring good things and good people into my life to help me achieve great things. It didn’t work, but perhaps I was not “upbeaty” enough. So I am still in the search, and my bank account, as small as it was, is close to empty. One of the passions I still have is my passion to see people living with HIV/AIDS experience the best life that they can and to receive the best care and help that they need. So I follow HIV/AIDS news regularly. This week in Washington DC the International AIDS Conference is being held. It is the first time since 1990 that the conference has been in the USA. It was not held here in all those years due to the US policy banning people with HIV/AIDS from entering the country. But President Obama discontinued that discriminatory policy. I encourage you to take a look at the good information coming from this conference. At least take a look at the AIDS Memorial Quilt that has just been brought online. Seeing the names of those that have passed always brings me to tears. Now I am not against helping those suffering with disease wherever it is found, so I am thankful that the church finally saw the devastation that was being cause by AIDS. What I struggle with is that the church has decided who deserves help, and who doesn’t. We can spend thousands of dollars and human power ministering to those in Africa because it is a disease that afflicts mainly heterosexuals. In America, it is still primarily a disease that afflicts our gay population. In the early days of the AIDS epidemic, the church, like President Ronald Reagan, remained mainly silent as gay men began to die at an alarming rate. The government was slow to respond with the money and research that may have saved thousands of lives. Only after it was finally identified as GRID (Gay Related Immune Deficiency) did the church respond. How? With grace, mercy, and unconditional love? No. Some in the Evangelical Church, supposedly speaking for God, said that it was judgment and punishment for practicing abomination. That is all most of the church did, condemn and judge and remain silent until somewhere in the late 1990″s. But by then, the animosity toward the church from the gay community had been entrenched. And the church was to blame. Last year, with the help of a local church and a fairly well-known Christian group in the Buffalo area, the church I attend sought to sponsor a World AIDS Day event on December 1st. Many churches were contacted, and posters and flyers distributed. All the churches in the area were made aware, only a few people out of thousands turned out. There is stigma still attached to HIV, and there is also an unwillingness on the part of most Evangelicals to have anything to do with the LGBT community. The only time the gay community is made aware of what the Evangelical church is doing in their community is when the faithful show up with signs at a Gay Pride event, or a local pastor writes an editorial condemning marriage equality. It is more important as a Christian to show unconditional love to all people, rather than letting them know what we think is wrong with them. There is a “friend” I have on Facebook, who constantly reminds me that unconditional love does not mean tolerating and encouraging sin. In other words he will not help people unless they change. I pray that this is not the mindset of the majority of Evangelicalism. But from what I have seen and observed over the last thirty years, that is not the case. We are called to show compassion to all just as Christ was moved to compassion for us. We didn’t deserve his compassion. We have all brought on our own suffering as we are self centered beings, broken. But Christ still has compassion on us. It is ashamed that Christians choose to err on the side of judgment and condemnation rather than on grace, trusting the Holy Spirit to do his part. I think it is sad that “Christian ” people refer too often to sin and repenting -sometimes things happen in life – (like HIV, drug./alcohol addiction for reasons we may never know – what right do any of us have to judge another. can make people try to ignore or forget these people exist and need help and love. Thank you so much for your comments. They are an encouragement to keep mocing forward. Peace to you. I saw the Quilt when it covered the Rose Bowl in Pasadena many years ago. It left me unable to speak. Remembering it almost renders me unable to type. it is overwhelming. 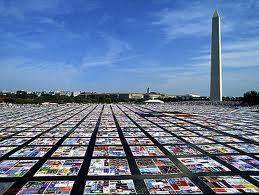 I saw just a few panels at the United States AIDS a few years ago and that it was so moving.